The potato is undeniably America's favorite vegetable. Whether it's prepared as a meal of its own with a smorgasbord of toppings or as part of a full-course dinner, the fresh taste of a potato is irresistibly delicious! 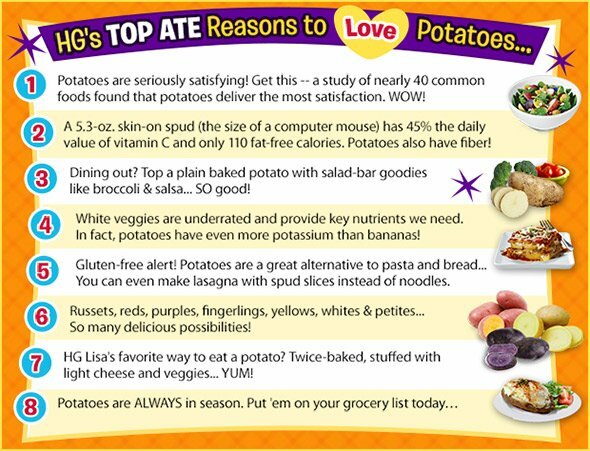 The Food Network's Hungry Girl, Lisa Lillien, has partnered with the United States Potato Board to help spread the word on how potatoes can be part of a healthy diet. "How can you not love potatoes? Potassium, vitamin C, fiber, and just 110 calories in a 5.3-oz. skin-on spud," says Hungry Girl Lisa Lillien. "With many unique colorful types to choose from and so many ways to prepare them, potatoes ROCK!" Learn more about potato, sweet potato and onion nutrition, the history of potatoes, potato varieties, and onion varieties.